The club have today completed the loan signing of Iain Wilson from Premier league side Kilmarnock. The midfielder who can also provide defensive cover has just turned 20 years old in December. He is a product of the Rugby Park sides youth system and despite his young age has played nearly 50 games for the Ayrshire team, including their recent Scottish Cup tie against Forfar earlier this month. As well as playing for Kilmarnock he has been capped at U17, U19 and U21 levels for Scotland. Including representing his country at the 2017 and 2018 at the Toulon Tournament. Manager Gary Naysmith said “I am delighted that Iain has decided to join us on loan until the end of the season. 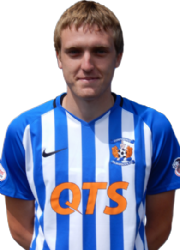 Although only 20, Iain has already made nearly 50 appearances for Kilmarnock including 30 starts. He is someone that Steve Clarke believes has a really big future ahead of him and this was shown by Iain signing an extension to his Kilmarnock contract early this season. Iain is equally comfortable as a central midfielder or a central defender however he can also play as a right back which is where he started in Kilmarnock’s recent Scottish cup tie against Forfar. His versatility will be a great asset to our squad in the remaining games of the season. Iain is also a current Scottish U21 International. His manager at Scotland Scot Gemmill is another who rates Iain very highly and we are delighted that Iain has chosen ourselves to help develop his career despite having offers from other clubs.